Brač is the third largest island in the Adriatic, and thus the largest in Dalmatia. The island is located between Split and island Hvar. Today, Brač is a famous tourist destination due to its amazing hotels, great tourist resorts and a wide selection of private apartments. 1. Hotel Bluesun Grand Hotel Elaphusa - Bol**** - this luxury hotel is caressed by the sun in the morning and the scent of the Mediterranean plants with the shade of secular pines during the day. A short walk takes you to the famous beach Zlatni rat, and crystal Adriatic sea invites you you to take a dive and feel refreshed. 2. Hotel Bluesun Hotel Borak - Bol*** - Hotel Borak is hidden in the natural shade near the walking path that connects the most famous beach in Dalmatia - Zlatni rat with the picturesque Dalmatian town Bol. Hotel Borak offers a wide range of facilities that will please all of our guests on their Croatian vacation. It is close to the sea and to the beautiful island beaches, surrounded by pine-trees and decorative Mediterranean plants. 3. Hotel resort Velaris - Supetar*** - this resort consists of several buildings that contain spacious and comfortable hotel like rooms. Enjoy the beach that is only 30 meters away or the beautiful outdoor pool. This resort offers rooms both with three and four stars. Places like Bol, Supetar, Milna and Sumartina are typical dalmatian island towns and tourist centers where you can choose accommodation in one of the hotels, apartments or resorts. 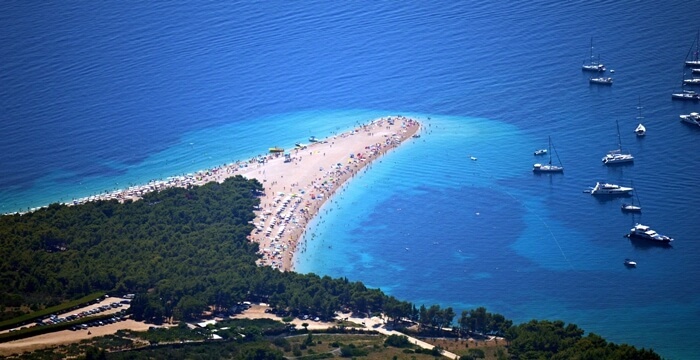 If you wish to have fun on the famous beach Zlatni rat, known for the fact that it changes its form due to the change of currents and waves, feel the summer joy and spend your holidays on one of the most attractive islands of Dalmatia. Brač is an island that will surely fulfill your expectations. Nearby lie town of Split, Hvar and Korcula which are easily accessible for one day trips. A wide selection of various private apartments can be found at No Name apartments - Bol. Special attraction on the island of Brač is Zmajeva spilja (Dragons Cave) in the village Murvice, which was a temple of glagolic priests in the XV. century, and even today a myth of one eyed giant Orkomarin is still alive. Kopačina cave is also interesting for its archaeological findings from neolithic era. Also interesting are artificial lakes (Nerežiške vode) from Austo-Hungarian times which today are a home to numerous gold fish. We offer total 319 facilities.